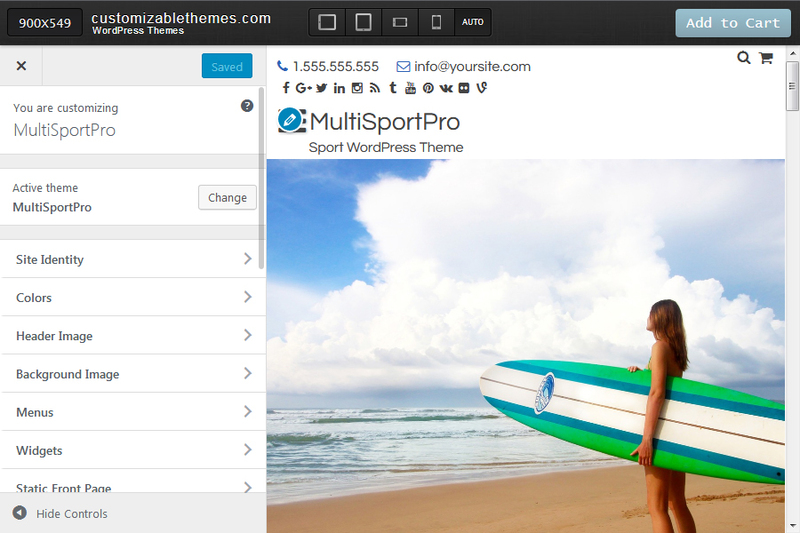 Install and activate a Premium Theme from us. The newly opened page contains Left Menu with different Sections and a preview screen (if you apply a change in the left menu, the new change will be displayed in the preview screen). You can change some of the theme options from the left menu. Click on ‘Save & Publish’ button to apply the changes to your website. Code before </head> tag – Sometimes it’s necessary to add some code before head closing tag, i.e. Google Webmaster Tools verification code. It can be done easy from theme options instead of editing theme files – juts enter your code in this text area and save changes. Code before </body> tag – The entered code here will be added before the body closing tag of your website. Show Author Info After Single Posts – When it’s checked the Author Info Box (a box with information about an author) after all single posts. Show Social Sharing After Single Posts – When it’s checked a list with social icons for sharing will be displayed after single post pages. Show Author Info After Single Pages – When it’s checked the Author Info Box after all single pages. Show Social Sharing After Single Pages – When it’s checked a list with social icons for sharing will be displayed after single pages pages. Display Author Links for Posts – the author link will be displayed to the posts content. Display Author Links for Pages – the author link will be displayed to the pages content. ‘Colors’ Section – contains options to customize the theme colors. You can learn more in Customize Theme Colors article. ‘Header Image (Logo)’ Section – contains options to customize your website header logo. You can learn more in Header Logo article. Display Social Icons in Header – when it’s checked the social icons (with URLs set in ‘Social’ Section) will be displayed in your website header. Open Header Social Icons in a new window – when it’s checked the header social sites URLs will opened in new windows. Page Header Background Image – you can customize the page header section by setting a background image to it. Number of Columns in Footer – you can choose between none, 1, 2, 3, and 4 columns to be displayed in your website footer. Display Social Icons in Footer – when it’s checked the social icons (with URLs set in ‘Social’ Section) will be displayed in your website footer. Open Footer Social Icons in a new window– when it’s checked the footer social sites URLs will opened in new windows. Copyright Text in Footer – the Copyright text that will be displayed in your website footer. Display Slider – when it’s checked the Slider will be displayed. Display Latest Posts – when it’s checked the latest post (or static page content) will be displayed. Display Sidebar – when it’s checked the sidebar widget area will be displayed. Number of Columns – you can choose between none, 1, 2, 3, and 4 columns to be displayed in your website homepage. Homepage Above Columns Background Image – image to be add as a background to the Above Columns Widget Area. Homepage Above Columns Background Image Fix Position – when it’s checked the background image of Above Columns Widget Area while scrolling. Homepage Columns Background Image – image to be add as a background to the Homepage Columns Widget Area. Homepage Columns Background Image Fix Position – when it’s checked the background image of Homepage Columns Widget Area while scrolling. Homepage Below Columns Background Image – image to be add as a background to the Homepage Below Columns Widget Area. Homepage Below Columns Background Image Fix Position – when it’s checked the background image of Homepage Below Columns Widget Area while scrolling. Slider Height (Large Resolution) – the slider height in pixels for large screen resolution (screen width larger than 800 px). Slider Height (Small Resolution) – the slider height in pixels for small screen resolution (screen width lower than 800 px). Display slide #1 in the slider – when it’s checked the slide No. 1 will be displayed to the slider. Display slide #2 in the slider – when it’s checked the slide No. 2 will be displayed to the slider. Display slide #10 in the slider – when it’s checked the slide No. 10 will be displayed to the slider. Globally Enable Lightbox functionality – when it’s checked the Lightbox will be enabled to your website. Enable on Home Page – when it’s checked the Lightbox will be enabled in your website homepage. Enable on Blog Index Page – when it’s checked the Lightbox will be enabled in your blog index page. Enable on Posts – when it’s checked the Lightbox will be enabled in your posts pages. Enable on Pages – when it’s checked the Lightbox will be enabled in your website pages. Enable on Archive – when it’s checked the Lightbox will be enabled in your website archive pages. Group Items – when it’s checked the Lightbox images will be grouped when they are displayed with the script. Globally Enable Thumbnails functionality – when it’s checked the thumbnails will be added to the posts display. Thumbnail image size in Index Pages – you can choose between ‘none’, ‘thumbnail’, ‘medium’, ‘large’, and ‘full’ sizes of thumbnail images to be displayed in posts index pages. Link Thumbnails to Single Post URLs – when it’s checked the thumbnail image will link to the corresponding post. Display in Single Post – when it’s checked the thumbnails will be added to the post pages. Thumbnail image size in Single Posts – you can choose between ‘none’, ‘thumbnail’, ‘medium’, ‘large’, and ‘full’ sizes of thumbnail images to be displayed in posts single pages. Center Google Map Latitude – the latitude coordinate of the contacts map (added in Contacts Page template and Google Map widget). Center Google Map Longitude – the longitude coordinate of the contacts map (added in Contacts Page template and Google Map widget). Office #1 Name – the name of Office No. 1 listed in the Contacts Widget. Office #1 Latitude – the latitude coordinate of Office No. 1 displayed as marker in the Google Map. Office #1 Longitude – the longitude coordinate of Office No. 1 displayed as marker in the Google Map. Office #1 Address – the address of Office No. 1 listed in the Contacts Widget. Office #1 Phone – the phone of Office No. 1 listed in the Contacts Widget. Office #1 Email – the email of Office No. 1 listed in the Contacts Widget. Office #2 Name – the name of Office No. 2 listed in the Contacts Widget. Office #2 Latitude – the latitude coordinate of Office No. 2 displayed as marker in the Google Map. Office #2 Longitude – the longitude coordinate of Office No. 2 displayed as marker in the Google Map. Office #2 Address – the address of Office No. 2 listed in the Contacts Widget. Office #2 Phone – the phone of Office No. 2 listed in the Contacts Widget. Office #2 Email – the email of Office No. 2 listed in the Contacts Widget. Office #20 Name – the name of Office No. 20 listed in the Contacts Widget. Office #20 Latitude – the latitude coordinate of Office No. 20 displayed as marker in the Google Map. Office #20 Longitude – the longitude coordinate of Office No. 20 displayed as marker in the Google Map. Office #20 Address – the address of Office No. 20 listed in the Contacts Widget. Office #20 Phone – the phone of Office No. 20 listed in the Contacts Widget. Office #20 Email – the email of Office No. 20 listed in the Contacts Widget. Image – an image to be displayed to the Not found page. Title – the title to be displayed to the Not found page. Content – the content to be displayed to the Not found page. Display WooCommerce Sidebar – when it’s checked the WooCommerce sidebar will be displayed in the Shop page. Products per Page – the number of the products to be displayed per page of the Shop page.